Waterfowl — Use a scope from each of the boat ramps. Walking the dike between the two reservoirs is productive (and extremely cold) in poor weather. Gulls — A scope from the boat ramp of #2 (the largest reservoir). Also, scoping from the eastern parking lot of #2 (locally known as Butternut) can be productive early in the morning. Shorebirds — Park at #1 boat ramp and walk the small reservoir. The total distance is 1.9 miles, but practically all shorebirds (except for Spotted Sandpipers) are seen on the center dike. Note: Dressing for the weather is especially important. This location is easily the windiest location in the county, and the weather can change quickly. From personal experience, if you are on the center dike, you cannot get back to your car quickly when rain, sleet, snow, or thunderstorms hit. Both Findlay reservoirs are southeast of Findlay. They can be reached by traveling 2.5 miles southeast from Findlay on OH-37 to Hancock County Road 205, proceeding east one mile to County Road 234, north to Township Road 207, then east to the boat ramp on Reservoir 2. Reservoir 1 can be reached by continuing on County Road 205 one mile east past County Road 234. Findlay Reservoirs 1 and 2 are upground reservoirs; water is pumped in from the adjacent Blanchard River and area wells. Reservoir 1 was built in 1950 by the city of Findlay as a municipal water supply. It has a surface area of 186 acres and a capacity of 1.4 billion gallons. The bottom is relatively flat with depths ranging from 20 to 28 feet and an average depth of 24 feet. There is little aquatic vegetative cover. Findlay Reservoir 2 was constructed in 1968 as the first upground reservoir completed under the Northwest Ohio Water Development Plan, to provide water to the city of Findlay, low-flow augmentation to the Blanchard River, and water for agricultural uses and recreation. It was built cooperatively by the city of Findlay and Ohio Department of Natural Resources. Its surface area of 645 acres and capacity of approximately 5 billion gallons make it the largest upground reservoir in Ohio. The bottom is relatively flat but has considerably more variation than Reservoir 1 with depths ranging from 16 to 33 feet and an average depth of 24 feet. The maximum depth is in the conservation pool, which covers 25 percent of the reservoir of approximately 160 acres. Findlay Reservoir 1 has 2 miles of diked shoreline, and Findlay Reservoir 2 has 4.3 miles of diked shoreline. These reservoirs share a common dike about 1 mile long. The distance around the outside perimeter of the combined reservoirs is 5.3 miles. These reservoirs were built with earthen dikes that are approximately 12 feet wide at the top with 2:1 side slopes. The insides of the dikes are covered with limestone riprap to protect them from wind and wave damage. 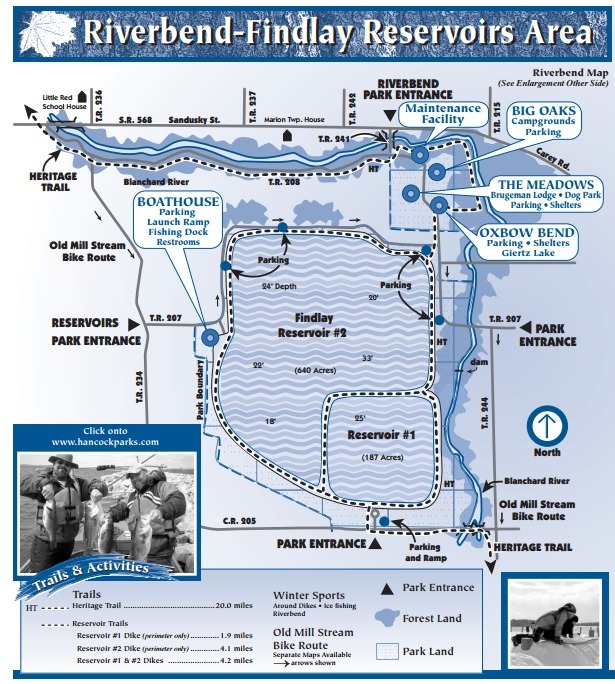 Both reservoirs are open to public fishing through a cooperative agreement between the city of Findlay and the Ohio Department of Natural Resources Division of Wildlife. Restrooms on site, portable toilet at side ramp area of Reservoir #2.